by Jonathan Rubin, Liat Segal & Assaf Talmudi 18 Darbuka drums and 36 robotic arms are controlled via wireless communication. Drum music is composed and played at a music sequencer on an iPad. The project was presented at the Bat-Yam international biennale of landscape urbanism, September 2010, as a part of the 'Green to Blue' ecological street project, by Matanya Sack and Uri Reicher. 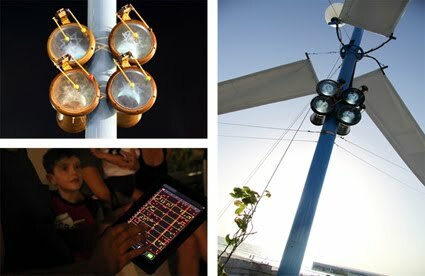 During the biennale, electricity generated by wind turbines and photovoltaic cells was used to operate the robotic Darbuka drums. The drums were mounted on the wind turbines columns, creating a hybrid, digital-mechanic drumming circle, a futuristic-traditional acoustic space. So, what do we have here... 18 darbuka drums, each drum is played with two sticks mounted on servo motors and is lit by a super-bright 1W LED. 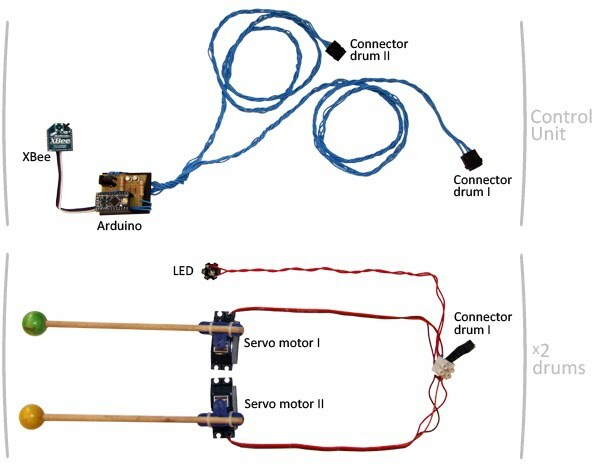 We chose to use drum sticks mounted on servos (rather than the traditionally used solenoids) in order to achieve a powerful sound accompanied by a visual effect of a drumming circle. A master netbook, running Max/MSP, sends control commands wirelessly (via XBee radio transceiver) to all control units. As a final touch, we added an iPad interface to give an easy and intuitive way to interact with the installation. OSC protocol was used for wireless communication between the master netbook and the iPad (via Wi-Fi). Three modes for playing the drums in real-time have been designed. The Sequencer mode allows composing specific beats for each of the 36 drum sticks. At this mode users can design and play loops and when happy with a loop, save it as a preset. Users can shift between previously saved presets at Presets mode. Users can also play the drums by 'hitting them' at a location based Intuitive jamming mode. At both the Sequencer and the Presets modes, the user can control the BPM of the loop by either switching a dial or shaking the iPad at the desired tempo. Additionally, the user can switch between parts of the loop (and either play the entire loop, 1/2, 1/4 or 1/8th of it).